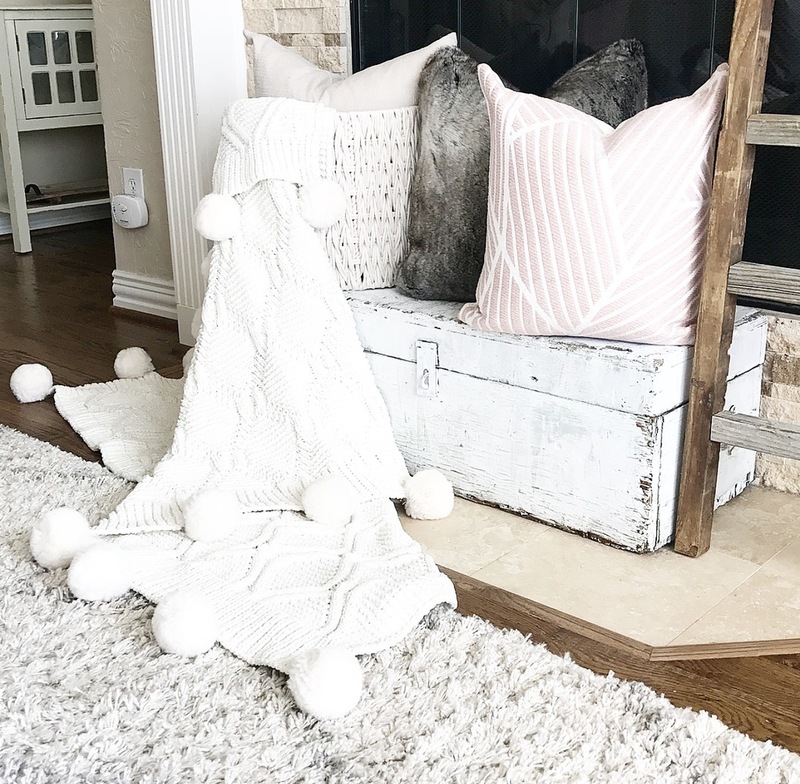 Once all that holiday sparkle is packed away for another year, I always crave simple, clean and cozy! 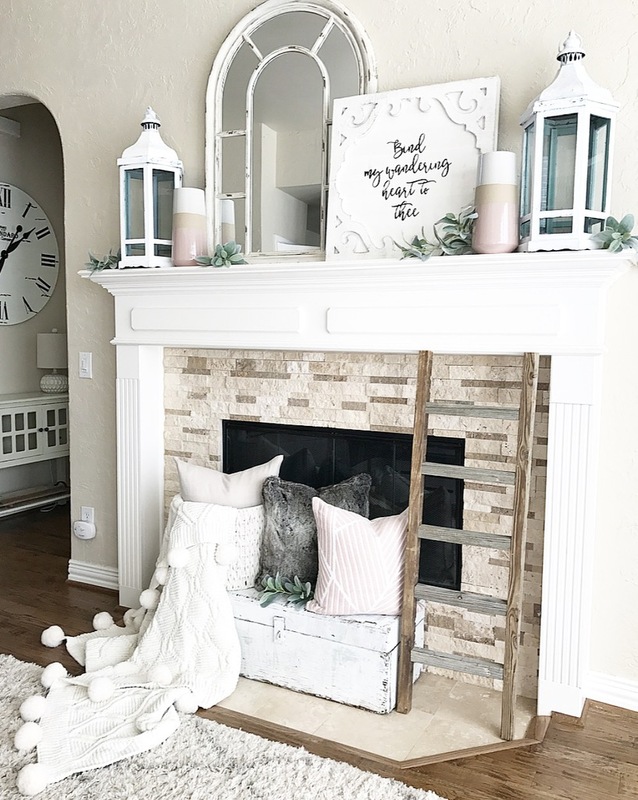 I added a few new winter touches to our living room that I wanted to share with you today, so come on in and cozy up! 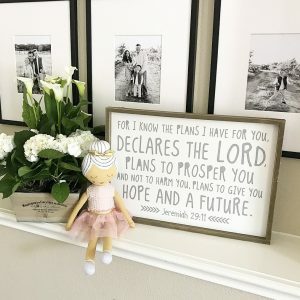 If you are here from Deborah’s Hip & Humble blog, welcome! 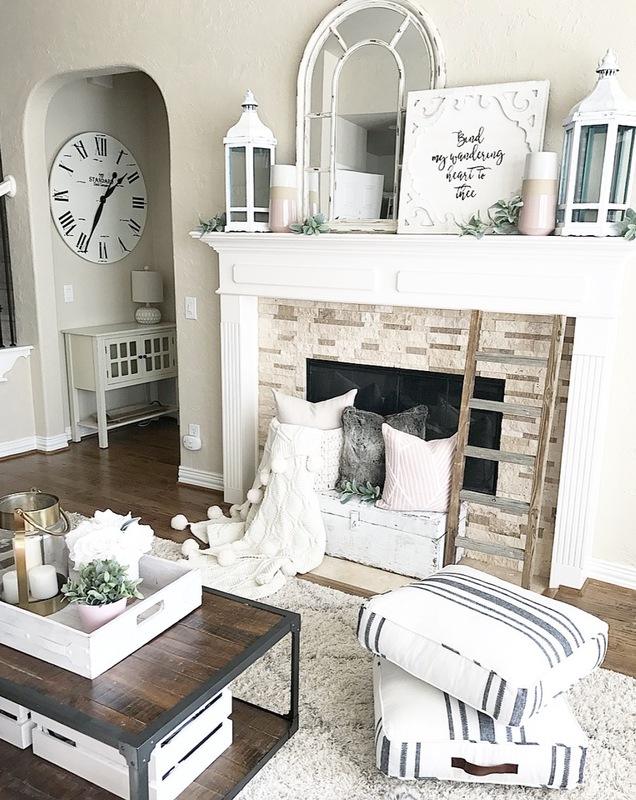 I always love seeing how other people decorate their homes, so these blog hops leave me inspired! You can see a list of all the talented ladies sharing their homes throughout the week at the bottom of this post! Living in North Texas, we don’t always have the coldest of winters. In fact, in ten years, I’m not sure we have ever actually used this fireplace for a fire, BUT there is a possibility of snow this week (tonight actually, EEK!! ), so we may just have to crank her up! I am totally color crushing on blush this time of year! 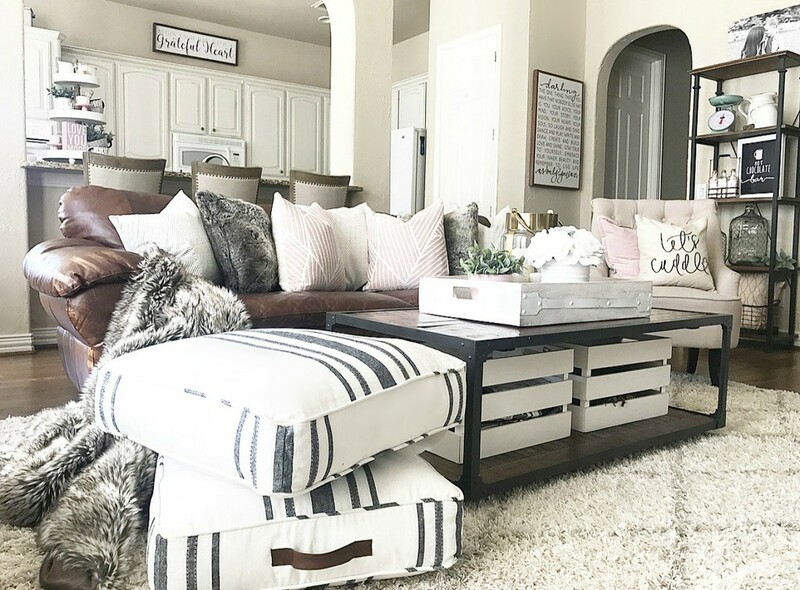 It mixes well with all the neutrals, but also provides a fun, pretty pop, and while I don’t really decorate for Valentine’s Day, it feels a little festive for that as well! I loved this sign! 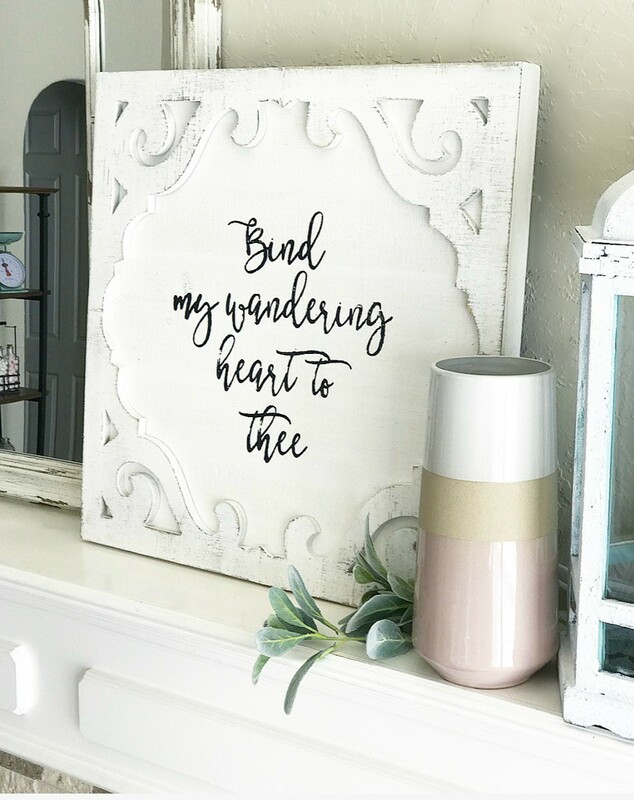 The corbel-like corners and the sweet quote from the hymn, ” Come Thou Fount of Every Blessing.” This hymn was written in 1757, and while some of the language is obviously from a different century, the words of this hymn completely ring true and hit home today. If you are not familiar, you can read the full hymn here. And then, the pillows….guys, I might have a problem! 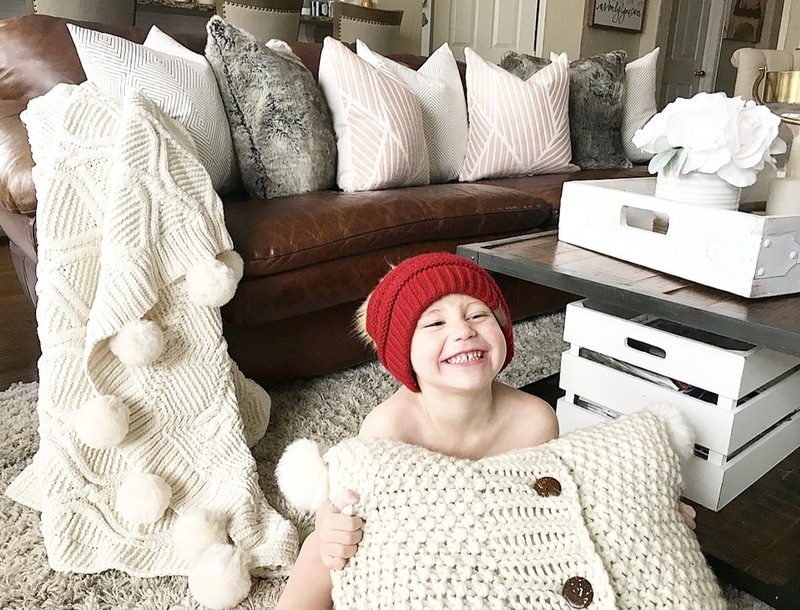 I am somewhat of a pillow hoarder, but I think they are such an easy, inexpensive way to freshen up a space….and I think this little nugget agrees! I almost always buy pillow covers and then use down inserts. This makes storing them so much easier when I change them out each season, and I love the squishiness (that is a word, yes?) of the down! These floor pillows are also a fun addition. I scotch guarded them, so hopefully they will survive the mayhem of having two boys! I love the size and the handles! This tray is also a favorite to decorate each season! This is the extent of my Valentine’s décor….an I love you more sign and easily accessible chocolate….crushing those new year’s fitness goals! And I made this hot chocolate bar sign! 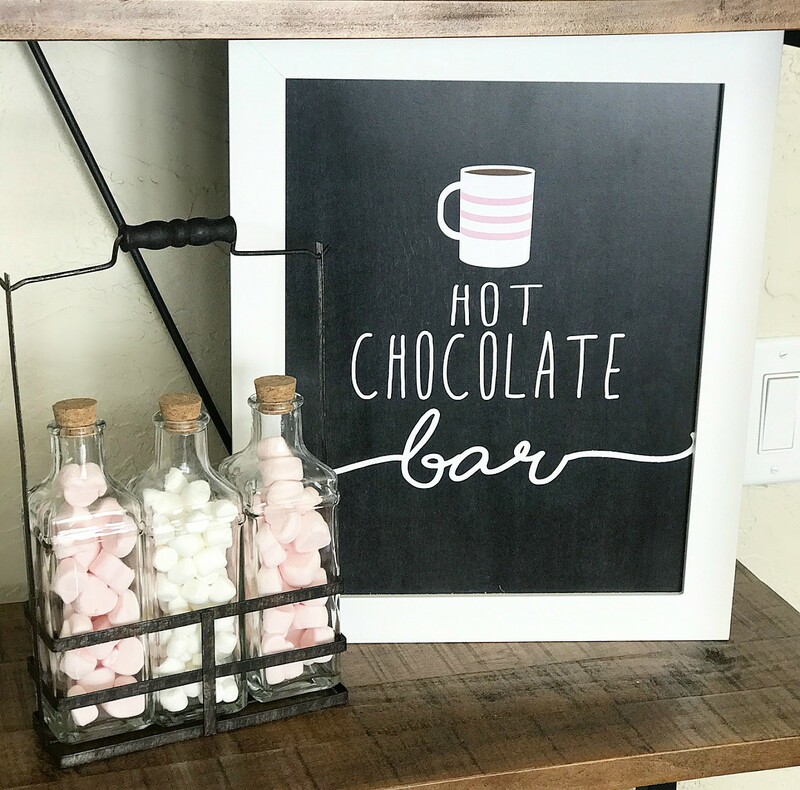 I’ll be sharing a slow cooker hot chocolate recipe and this free printable with you in another post soon if you want to set up a little hot chocolate bar of your own! 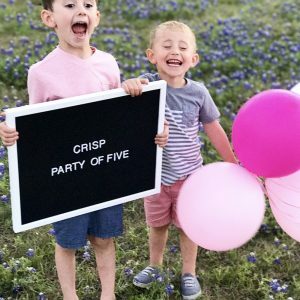 Such a fun idea for parties and showers this time of year! 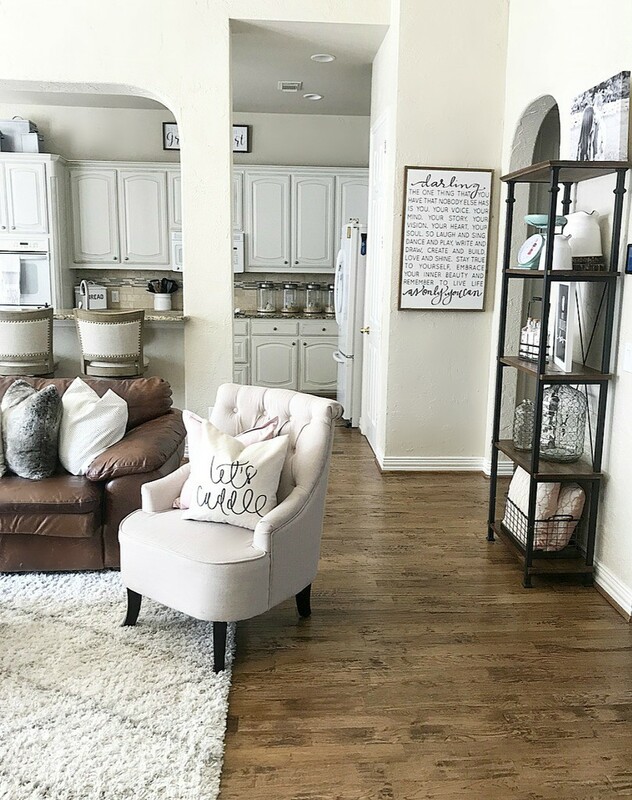 Overall, I just want this space to feel warm and inviting…and if the temps force us to be cuddled up on the couch with a cup of cocoa and a fuzzy blanket, I won’t be mad about it! Be sure to head over to Kathy at A Delightsome Life next for beautiful inspiration! We will be hosting a Linky Party on Friday, January 20 for you to post your winter decor! Share with us how you transitioned from your Christmas decor to Winter decor! Hello Bethany! Looks marvelous! Love the sign of the hymn title – gorgeous. Such a lovely, cozy home! I love pillows too and have so many blankets – it is definitely snuggle, cuddle time! 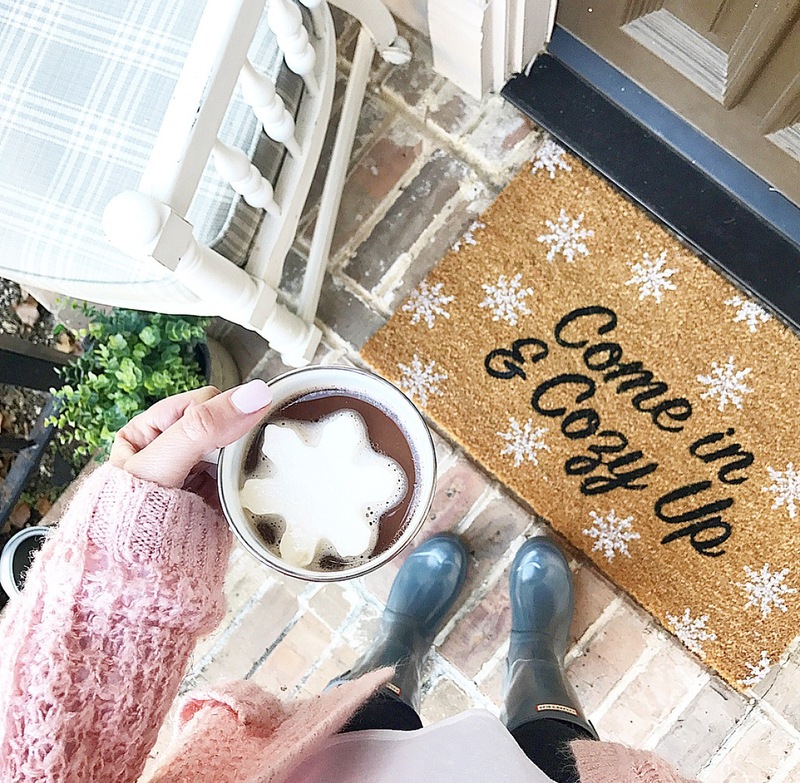 Beautifully done – I am so delighted to share this week’s inspiring Neutral Winter Home Decor blog hop with you and these fantastic ladies! You are so kind Kathy! I can’t thank you enough for putting this together! So much inspiration! This is gorgeous Bethany!! The pics of your son are just the SWEETEST!!! 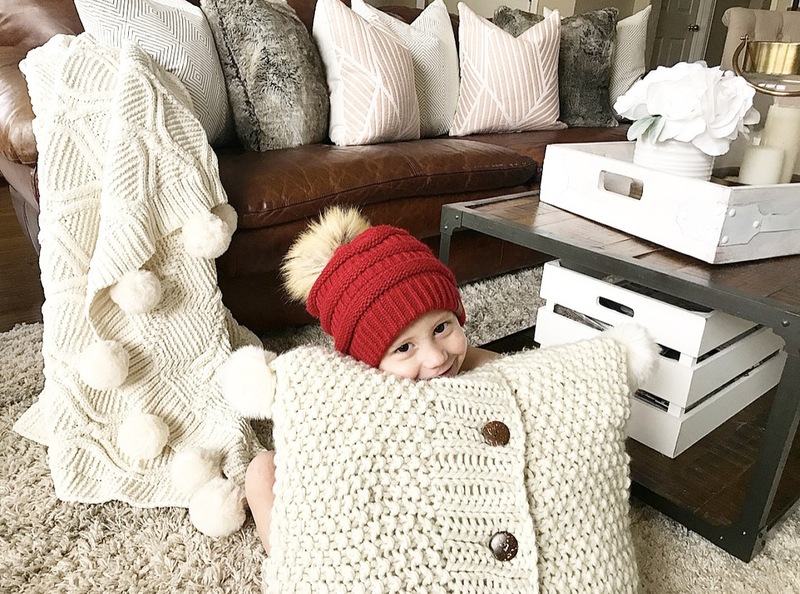 Your home for winter looks so perfect and cozy!!! Too kind Jaclyn! But don’t be fooled…he had those pillows all over the floor in a hot minute! This is so cozy and the details are gorgeous. I love the cuddle pillow and the hot chocolate bar, so cute! 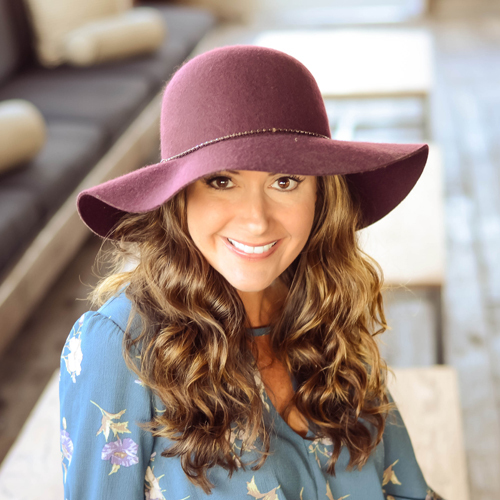 I’m so happy to be doing this tour with you and sharing your beautiful blog on mine! Thank you sweet Deborah! I appreciate you stopping by! 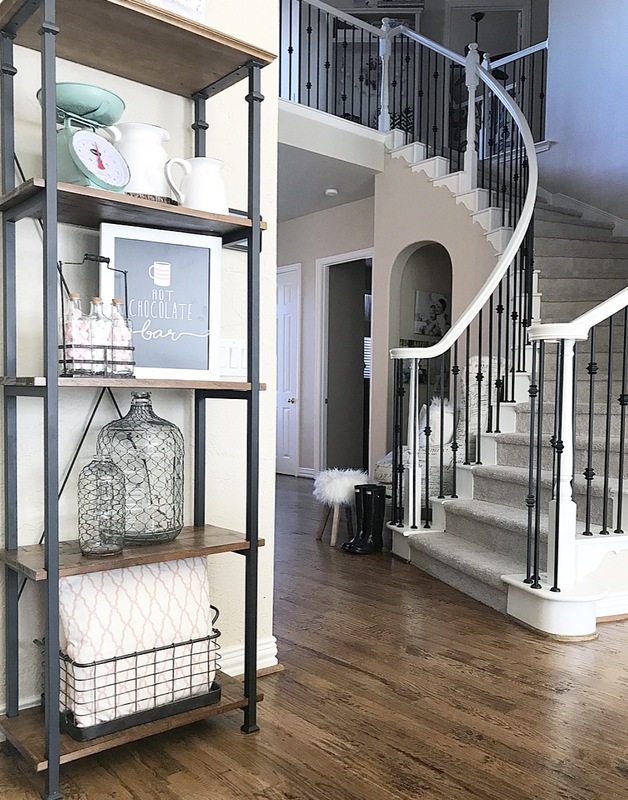 Bethany, I love every cozy detail of your beautiful home! I’m so excited to be joining you on this tour! Stay cozy! Thank you sweet Pollie! So much inspiration on this tour! Now this is so cozy and yummy!! can I come over for hot chocolate? your home is so inviting. Aww! Thank you sweet Rhonda! Yes girl! I have a mug with your name on it!! 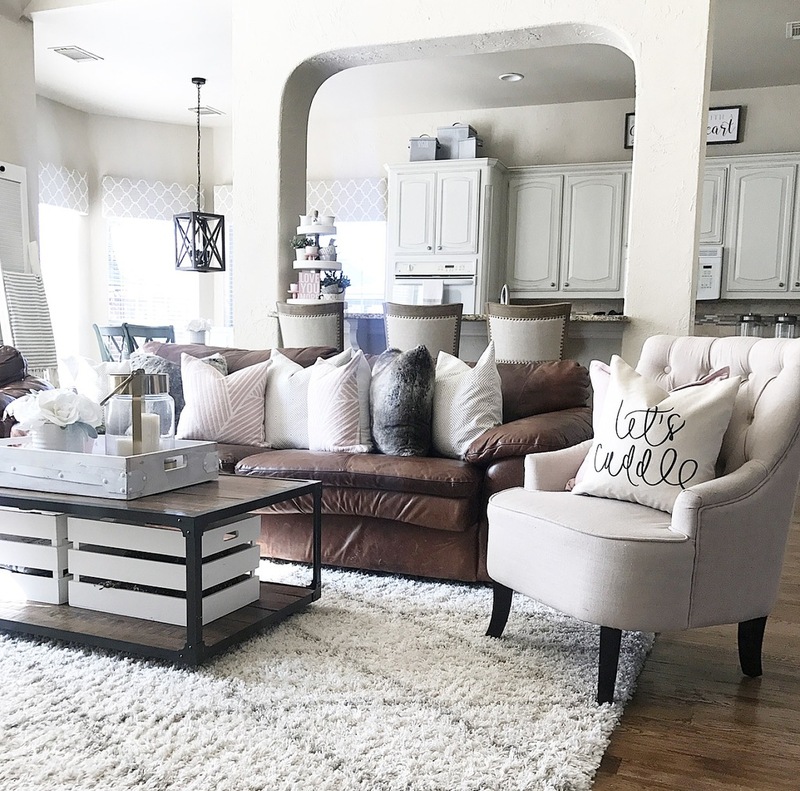 I love all of your pillows and tips for where to get cute ones like yours!! 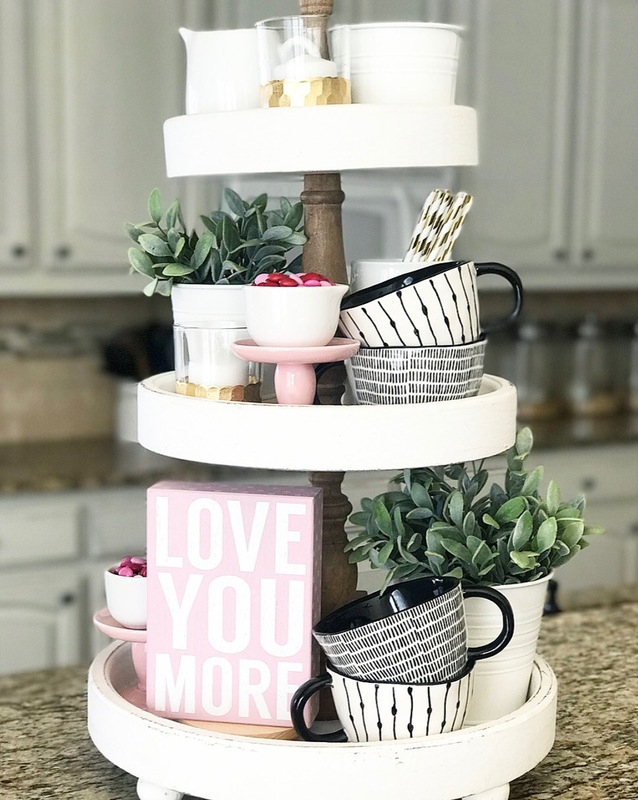 I also love the hot chocolate bar sign and your styled shelves! 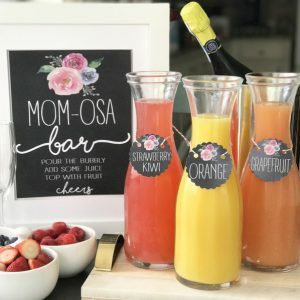 Can’t wait for the recipe and always love your printables!! Beautiful tour of your lovely home! Your home looks beautiful Bethany! And the shots of your kids are adorable!! Beautiful! What color is on your walls? Hi I love the paint color on the walls. Can you please tell me what it is? Pretty house! Thank you! Of course! It is Sherwin Williams Navajo White.